Beef slowly cooks with root vegetables for a succulent stew, with fall apart tender meat. Excellent served with a bold French red wine. Make the marinade: In a large bowl, combine the marinade ingredients, from the rosemary through the red wine. Pat dry the beef with a paper towel, and place in a large, sealable plastic bag. Carefully pour in the marinade. Seal the bag, and gently toss the bag to coat the beef. Marinate in the refrigerator for at least six hours, or overnight. Prepare the Stew: When you’re ready to start cooking, preheat the oven to 300 degrees (convection setting if you have it). Place a strainer inside a large bowl. Pour the beef mixture into the strainer, using the bowl to capture and reserve the marinade. Remove the beef, scraping off big pieces of veggies, herbs and spices from the marinade. Set the beef aside in a bowl to cook. Heat the oil on medium heat in a dutch oven or oven proof copper pan. Add the chopped onion to the pan, cook for a few minutes until it starts to soften. Add the parsnips, carrots, mushroom and garlic to the pan, and cook for a few more minutes. Stir in the beef, combining it well with the onions and other vegetables. Salt to taste. Cook for 5 to 10 minutes, stirring occasionally to brown on all sides. Add the remaining stew ingredients to the pan with the beef and vegetables–reserved marinade, rosemary, thyme, cinnamon, ketchup, soy sauce, and beef broth. Stir to combine the ingredients. Cover the Dutch oven / copper pan and move the stew to the oven, where it will braise for a total of 3 hours. Braise at 300 degrees for one hour. If you are using a convection setting, lower the temperature to 275 after the first hour, and braise for an additional 2 hours at 275. If you are using a conventional setting, leave at 300 degrees for the entire 3 hours. After the stew has braised for 3 hours, carefully remove the stew from the oven. Ladle the stew into bowls to serve, along with mashed potatoes if you are using them. Braising is a technique whereby the food slowly cooks in liquid at a low temperature. It’s a great way to turn inexpensive cuts of meat into a great meal. For more on braising, see this post on The Spruce. Typically braising is done in a Dutch oven. Lately I have been using my oven proof copper pan with good results (Amazon affiliate link provided for you convenience). It’s much easier to clean then the cast iron Dutch oven. The recipe calls for 3 parsnips and 1 carrot. You could do 2 of each, or 3 carrots and 1 parsnip if you like. 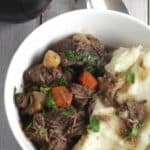 And certainly experiment with other root vegetables for this beef stew recipe.